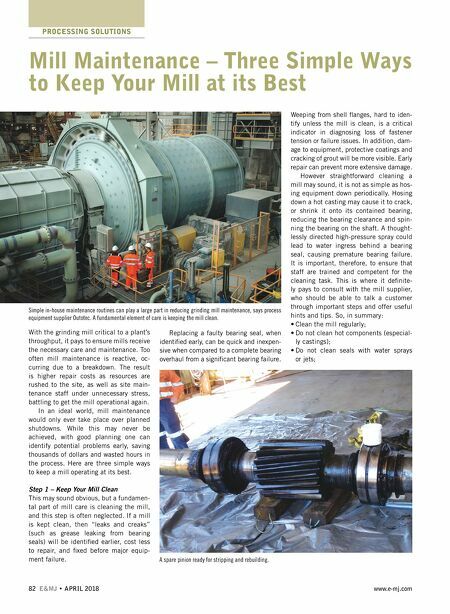 82 E&MJ • APRIL 2018 www.e-mj.com PROCESSING SOLUTIONS With the grinding mill critical to a plant's throughput, it pays to ensure mills receive the necessary care and maintenance. Too often mill maintenance is reactive, oc- curring due to a breakdown. The result is higher repair costs as resources are rushed to the site, as well as site main- tenance staff under unnecessary stress, battling to get the mill operational again. In an ideal world, mill maintenance would only ever take place over planned shutdowns. While this may never be achieved, with good planning one can identify potential problems early, saving thousands of dollars and wasted hours in the process. Here are three simple ways to keep a mill operating at its best. our Mill Clean This may sound obvious, but a fundamen- tal part of mill care is cleaning the mill, and this step is often neglected. If a mill is kept clean, then "leaks and creaks" (such as grease leaking from bearing seals) will be identifi ed earlier, cost less to repair, and fi xed before major equip- ment failure. Replacing a faulty bearing seal, when identifi ed early, can be quick and inexpen- sive when compared to a complete bearing overhaul from a signifi cant bearing failure. 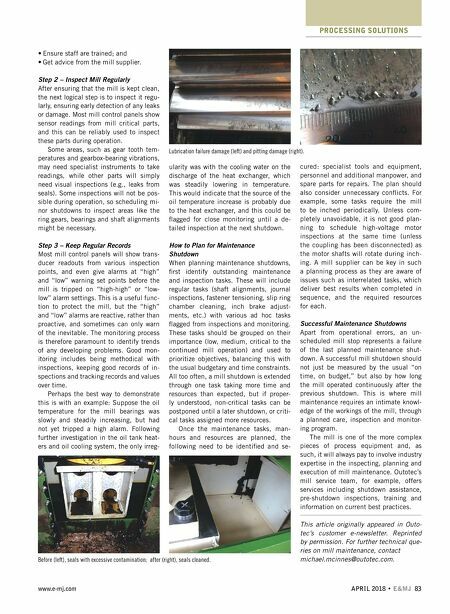 Weeping from shell fl anges, hard to iden- tify unless the mill is clean, is a critical indicator in diagnosing loss of fastener tension or failure issues. In addition, dam- age to equipment, protective coatings and cracking of grout will be more visible. Early repair can prevent more extensive damage. However straightforward cleaning a mill may sound, it is not as simple as hos- ing equipment down periodically. Hosing down a hot casting may cause it to crack, or shrink it onto its contained bearing, reducing the bearing clearance and spin- ning the bearing on the shaft. A thought- lessly directed high-pressure spray could lead to water ingress behind a bearing seal, causing premature bearing failure. It is important, therefore, to ensure that staff are trained and competent for the cleaning task. This is where it defi nite- ly pays to consult with the mill supplier, who should be able to talk a customer through important steps and offer useful hints and tips. So, in summary: • Clean the mill regularly; • Do not clean hot components (especial- ly castings); • Do not clean seals with water sprays or jets; Mill Maintenance – Three Simple Ways to Keep Your Mill at its Best Simple in-house maintenance routines can play a large part in reducing grinding mill maintenance, says process equipment supplier Outotec. A fundamental element of care is keeping the mill clean. A spare pinion ready for stripping and rebuilding.